A classic 9ct yellow gold 24 inch figaro link necklace. A stylish chain come rain or shine, work or play. 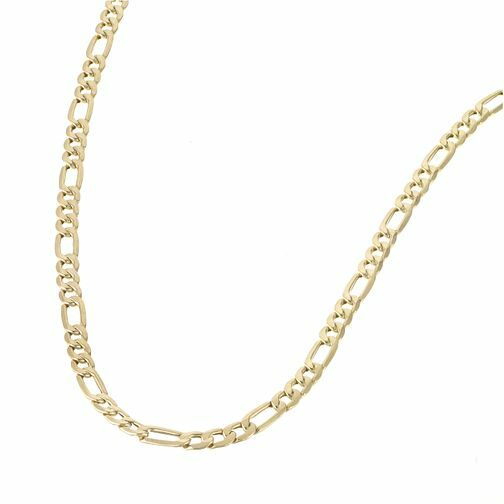 9ct Yellow Gold 24" Figaro Link Necklace is rated 1.0 out of 5 by 2. Rated 1 out of 5 by Anonymous from Terrible service and incorrectly described product Although the credit card was charged immediately the item was not available for collection until ten days later. The chain was hollow, which was not revealed in the description on the website and was returned immediately without taking it from the store. Rated 1 out of 5 by Anonymous from Hollow This chain is hollow. It is not correctly described. No mention was made in the description or specification on the website. Also Samuels delivery schedule is appallingly slow. I wasted 10 days with this inadequate product.